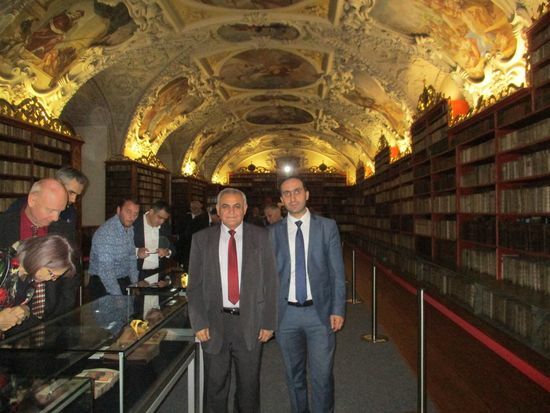 On October 8, in the Theological Hall of the Library of Strahov Monastery in Prague, which is one of the oldest and most luxurious libraries in Europe, took place the opening ceremony of the exhibition "Treasures of the earliest Christian nation: Spiritual Art and Music in Mediaeval Armenian Manuscripts" which was attended by Cardinal Dominik Duka, Czech Primate and Archbishop of Prague, the spiritual pastor of the Armenian community of Czech Barsegh Pilavchyan, the diplomatic staff of a number of countries and representatives of the Armenian community. The responsible for the libraries and museums of Strahov Monastery C. Shidlovsky, Armenian Ambassador to the Czech Republic Tigran Seyranyan, Deputy Director of the Matenadaran on scientific work Karen Matevosyan, Father Vahan from the Mekhitarist Congregation in Vienna, and Hayk Utijian, the exhibition coordinator and the author of the catalog delivered speeches. 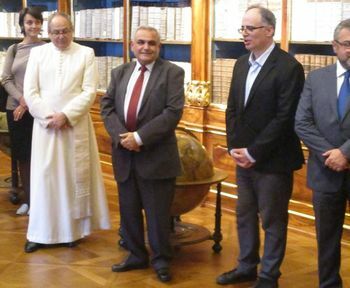 The deputy director of the Matenadaran particularly mentioned that the manuscript book is one of the main components of the Armenian cultural heritage, and the Armenian manuscripts have been given an important place in the exhibition dedicated to Armenian art opened only two weeks ago at the Metropolitan Museum in New York. The exhibition mainly presents a number of originals and copies of manuscripts of Mashtots Matenadaran, three manuscripts from the collection of Mkhitarist in Vienna, two ribbon prayer scrolls (hmayils) from Basmacian private collection (Paris) and a few other samples, which give a general idea about Armenian spiritual culture, in particular miniature art and musical art. The exhibition materials are thoroughly presented in the extensive catalog. The exhibition will last till November 5. By the way, it was found out that “Stepanyan's Grammar”, written in 1726 in Stanislavov, is an Armenian manuscript stored in the Strahov Library, the preliminary description of which was made by David Ghazaryan, senior researcher at the Matenadaran who was in Prague on the occasion of the exhibition.